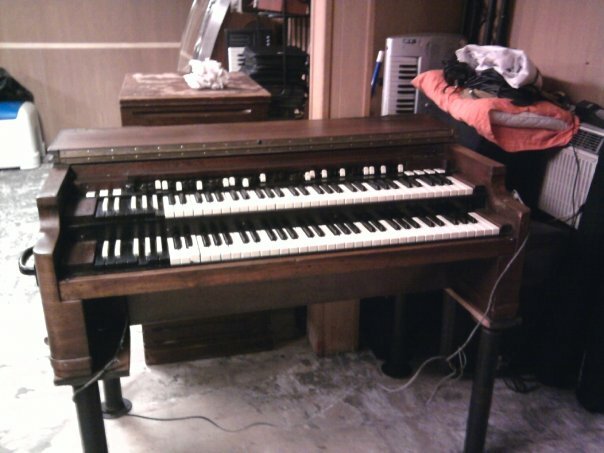 My son Reily took this picture right after he and I got the B3 into my basement studio on December 5th 2009. Having never set one of these up before I will be doing some research before I attempt to turn it on. From what I can see visually it will need some cosmetic work done to the case and I will have to repair the top and make a new fold down cover for the keys (all stuff that I can do in my home shop). As far as what needs to be done inside... Eric never got much further in our conversations about it other than to tell me "I'll show you how to oil it"... having never "oiled" an instrument before, so I assume I have my work cut out for me... I wish he was here to take on this project with me. Since it hasn't been played in many years I will have to be careful turning it on for the first time (luckily I have a friend who has a few B3's and I'm sure he'll be able to make sure I do no harm to it).